number of low-income men, Florida’s (35 percent) and Texas’s (36 percent) rates of routine checkups for low-income men are below the national average (45 percent). As shown previously, both states have a high percentage of uninsured low-income men; this may explain the relatively low rates of a routine checkup. Source: Urban Institute tabulations of the 2010 Behavioral Risk Factor Surveillance System. Note: Low-income men are age 18–44, live in families with incomes below $35,000, and do not have four-year college degrees. The nation’s capital and states along the East Coast tend to have the highest rates of low-income men who report a routine checkup in the past year, ranging from 54 percent in Georgia to 74 percent in Massachusetts and the District of Columbia. Other states with relatively high rates of routine checkups for low-income men include Minnesota and Wisconsin (55 percent each). Given the variation in insurance coverage among these states, it would seem that something other than insurance drives or invites men to seek regular health care. In most states, low-income men age 18–44 are less likely than men in families with incomes above $35,000 (or “higher-income men”) in that age group to report a routine checkup in the past year. The largest differences are in Kansas (25.7 percentage points), followed by Alabama, Florida, Kentucky, New York, and Oklahoma (all greater than 18 percentage points). Some states, however, have higher rates of routine checkups among low-income men than among higher-income men. The District of Columbia and North Dakota, Hawaii, Wisconsin, and Alaska all have higher checkup rates for low-income men age 18–44 than for higher-income men (7 percentage points or more). Nationally, a greater percentage of low-income African American men reports a routine checkup in past year (61 percent) than low-income white men (44 percent) and Hispanic men (40 percent) do. However, the checkup rates for men are generally lower than those for women at similar income levels. For example, the rate for African American women with incomes below $35,000 is above 80 percent. 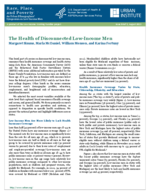 Low-income men are four times as likely as higher-income men to report fair or poor health. Almost one in five (19 percent) low-income men report being in fair or poor health versus one in 20 (4.9 percent) higher-income men age 18–44. Low-income men are also less likely than higher-income men in this age group to report that they are in either very good or excellent health (41 versus 70 percent). Among low-income men, Hispanics are more likely to report fair or poor health (23 percent) than whites (17 percent) and African Americans (18 percent). Low-income Hispanic men are also the least likely to report excellent or very good health (34 percent) while African American men are the most likely (50 percent). The share for low-income white men is 45 percent. Reports of health status across the states generally appear to follow trends in health insurance coverage. Nevada, which has the fourth-largest uninsured rate among low-income men, has the second-largest share of men reporting fair or poor health (31 percent). Similarly, Texas, New Mexico, and North Carolina have above-average uninsured rates and an above-average share of low-income men reporting fair or poor health. The District of Columbia, with the second-lowest uninsurance rate, has the highest share of low-income men reporting excellent or very good health (58 percent). There are exceptions. Georgia, which has the third-highest uninsured rate, has the third-lowest rate of low-income men reporting poor health (9 percent). Massachusetts has the highest share of low-income men reporting fair or poor health (31 percent), despite having the lowest percentage of low-income men who lack insurance coverage. Mississippi, which has a high share of uninsured low-income men, has the second-highest rate of low-income men reporting excellent or very good health (57 percent). Massachusetts has the largest disparity in reported fair or poor health between low-income men and higher-income men (27.3 percentage points). The disparity is greater than 10 percentage points in 37 other states. Looking at another measure of health, obesity, nearly one in three (30.8 percent) low-income men in the United States is obese; this is somewhat higher than the rate for non-low-income men age 18–44 (26.3 percent). Among the top 10 states, Texas and Michigan have the highest obesity rates for low-income men at 37 and 35 percent, respectively (figure 4). The obesity rate for low-income men is also above the national average for higher-income men age 18–44 (26.3 percent) in Florida, North Carolina, and Pennsylvania. Illinois, another top 10 state, has the fourth-lowest obesity rate of all states (22 percent). In the nation as a whole, Oklahoma, Minnesota, Indiana, Kansas, Idaho, and New Mexico have the highest obesity rates for low-income men at 38 percent or higher. The states with the largest differences in obesity rates for low-income men relative to higher-income men are Idaho, New Mexico, and Minnesota (14 percentage points), Oklahoma (13.1 percentage points), and the District of Columbia (12.7 percentage points). In a few states, such as Alaska, Oregon, and West Virginia, low-income men are less likely than higher-income men to be obese. Nationally, Hispanics have the highest obesity rate among low-income men (33 percent), followed by whites (30 percent) and African Americans (28 percent). Ohio has the highest obesity rate among low-income Hispanics (58 percent); the rates for white and African American men in the state are significantly lower (32 and 28 percent, respectively). Florida and Pennsylvania have the highest obesity rates among low-income African Americans (42 and 40 percent), while North Carolina has the highest obesity rate among white men (38 percent). Source: Urban Institute tabulations of the 2010 Behavioral Risk Factor Surveillance System data.